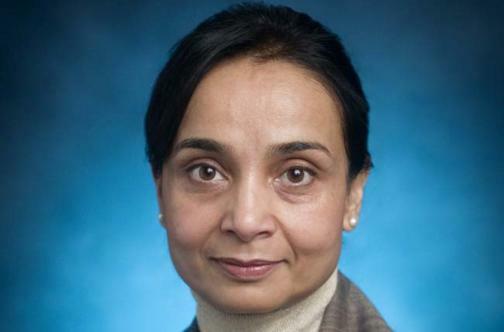 Dr. Sangita Basnet is an Associate Professor and Chief of Pediatric Critical Care at Southern Illinois University School of Medicine and Medical Director of the Pediatric Intensive Care Unit at St. John’s Children’s Hospital in Springfield, Illinois. She completed a three-year fellowship in critical care at Washington University School of Medicine in St. Louis (2002) and a three-year pediatric residency at Cook County Children's Hospital in Chicago (1999). She earned her medical degree at Tribhuvan University, Institute of Medicine in Kathmandu, Nepal (1993). Dr Basnet is board certified in pediatric critical care medicine and pediatrics, and is a member of the Society of Critical Care Medicine and American Academy of Pediatrics. Her overarching goal and vision is to improve child health and health outcomes within the pediatric intensive care unit, nationally and internationally. Her principal focus has been on quality improvement, patient satisfaction and family centered care, team building, and fostering an environment of safety culture. Her research interests include optimizing management of diabetic ketoacidosis, status asthmaticus, and procedural sedation. She is also keenly interested in international healthcare and has played a key role in establishing pediatric and neonatal intensive care units in her native country, Nepal. She is now leading a taskforce to standardize pediatric critical care in Nepal. Dr Basnet has published and presented widely on pediatric critical care in resource limited countries and quality improvement interventions in the pediatric ICU. Pediatric Critical Care attendings are dedicated to the teaching of medical students and pediatric residents. A one month elective is offered to fourth-year medical students with acceptable academic standing and successful completion of a third-year pediatric clerkship. Medical students are an important part of the multidisciplinary team taking primary responsibility for one to two patients. Education is primarily patient-based self-learning with several didactic sessions and bed-side teaching. Residents rotate through the PICU during their 2nd and 3rd years. They learn critical skills including assessment/recognition, monitoring, and stabilization of the critically ill child. Emphasis is placed on communication skills, professionalism, teamwork, and ownership. Self-learning is expected, however, scheduled didactics of important, pertinent topics in pediatric critical care are an integral part of the curriculum. SIU's pediatric intensive care unit (PICU) is one of 9 designated units in the state of Illinois and the only one in southern Illinois. It is an 8-bed unit with private rooms and state of the art technology and monitoring systems to take care of severely ill children. Our team is multidisciplinary and includes highly skilled nurses, respiratory therapists, pharmacists, nutritionists, physical and occupational therapists, child life specialists, and social workers, in addition to pediatric intensivists and resident physicians. We are dedicated to the care of burns, trauma, respiratory failures, septic shock, neurosurgical conditions, and other medical and surgical critical diseases. Our primary goal is evidence-based scientific approach to the management of critical illnesses in a family centered environment. The administration of sedative-analgesic medication allows infants and children to tolerate unpleasant procedures by relieving anxiety, discomfort, or pain; examples of such procedures include lumbar punctures, bone marrow biopsies, PICC line placements, abscess drainage, burn and other dressings, orthopedic procedures, and many others. It also facilitates procedures that are not really painful to the patient but require the patient to remain still; for example, MRI, renal scans, EMG, and other radiologic procedures. Procedural sedation enhances the child's comfort and acceptance of diagnostic and therapeutic procedures. Our Sedation Team consists of pediatric critical care physicians, anesthesiologists, and trained and certified pediatric sedation nurses that serve all inpatient and outpatient sedations 24 hours a day, 7 days a week. The goal of this team is to provide safe and effective high quality procedural sedation to infants and children. Our PICU is a major tertiary referral center for southern Illinois' pediatric medical and surgical illnesses. Referring physicians receive direct and immediate access to the pediatric intensivist, 24 hours a day, who guides the management and triage of the patient. Patients transferred to our hospital are directly admitted to the PICU or general pediatric floor. With a PICU attending physician serving as the medical control physician, the Pediatric Transport Team is dispatched to outside hospitals to assist in the evaluation, resuscitation, and transfer of sick children who require admission to our hospital. The team consists of trained critical care nurses and respiratory therapists and has the ability to transport these patients utilizing a dedicated ground ambulance or helicopter, in partnership with ARCH, designed and equipped for a high level of care.